An ideal riflescope is a vital part of any rifle, especially when going on a hunt or shooting sport. 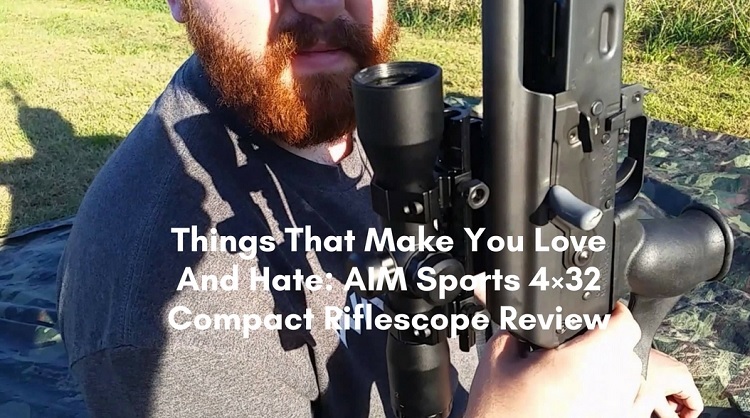 As such, the AIM Sports 4x32 compact rangefinder riflescope might be just what you need. With its superb reticles that are sloped to reduce internal reflection and give you an accurate lock on target, this riflescope does not disappoint. The riflescope is a far cry from other advertised scopes that don't deliver as per the promises that are given. The AIM 4x32 Riflescope is lightweight and makes use of its exceptional reticles to zoom in and view targets clearly. The scope can be adjusted to take precise long distant shots accurately. Efficiency during hunts is mandatory, and the 4x32 Riflescope gives nothing less. 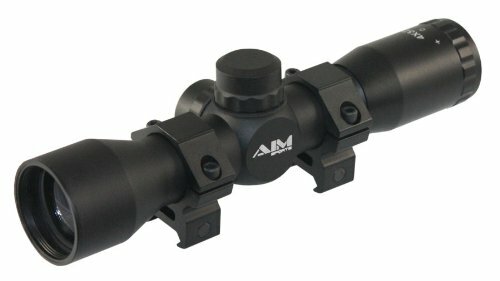 The AIM Sports 4x32 Compact Riflescope is a product of the esteemed AIM Sports Inc. The manufacturers of tactical accessories have outdone themselves this time with the creation of this compact scope that is now becoming a favorite of many hunting enthusiasts. Carefully read this review to see if this riflescope suits you. The Sports 4x32 Riflescope is a tough scope that boasts of remarkable features. There are different types of range scopes in the market and have varying features. This article describes the features of the 4x32 range scope that make it unique and a far cry from the other riflescopes. The multi-coated lenses on the scope give it a better light transmission and resolution ability. This allows the scope to accumulate light and thus view targets very clearly in excellent daylights. The only downside of the optics is that they do not give the right clarity and contrast in lighting a bad lighting condition. But on a positive note, the lens of the scope works exceptionally when shooting or hunting. The thickness of the scopes reticles allows a fixed magnification of 4X which is ideal for taking a perfect shot of about 50-60 yards off. Adverts on AIM Sports give the scope a shooting distance of as far as 100 yards, but the thickness of the reticles is too much to allow them to be fine-tuned to give clarity that will permit shots from such a long distance. ​As earlier mentioned, the 4x32 compact rangefinder riflescope has incredible light transmission features thanks to the multi-coated lenses. The scope, therefore, becomes a great fit for shooting during regular days as it allows enough ambient light to reach the eye. This light gathering ability is not right for a low-light hunt as the optics become blurry and visibility gets very low. ​With a weight of 10.9 ounces and a length of 7.75 inches long, the scope allows you to move your rifle around in your case when it is still mounted. This saves you a lot of tedious work of having to re-zero the scope whenever you take it out of the case or mounting it again on your rifle. ​One of the key features of the AIM Sports 4x32 Compact Riflescope is the size of area of view. With a field range view of 36.6' at 100 yards, the scope meets the shooting needs of any hunter or shooter unlike many other scopes out there in the market. ​The riflescope is very easy to mount. Included in its accessories are Weaver/Picatinny 1913 rings that make it compatible for mounting on many rifles. The rings hold the scope solid on the rifle when shooting so you do not have to mount and zero in all the time after taking shots. As much as the rings work efficiently to hold the scope during recoils, they sometimes become loose when the rifle is rested upside down or when one takes a sit, and this may force you to zero in again when you start re-mounting. ​This can be fixed by using a bit of Loctite to hold the mounting screws in place or just replacing them with scope rings of better quality. ​The AIM Sports 4x32 Compact Riflescope has 3'' eye relief that ensures your safety from recoils whenever you take shots. The relief is also improved to give fast target acquisition during hunts and sports shooting. ​The body of the scope is synthesized with aircraft-grade aluminum which is sturdy and durable. The material can withstand severe weather conditions due to its weather resistant seals together with its fog proof and shock-proof housing. As a result, you do not have to worry about breaking the lens due to an accident while in the fields. ​The AIM 4x32 riflescope sights efficiently within just a few shots. You can use a laser bore sighting tool to fine tune the adjustments first before heading out. This makes the scope better and can save you bullets as you won't end up wasting your shots on targets. ​So if you are ready to bag that deer today, the riflescope is a fabulous addition to your hunting gear. The 4x32 Sports Riflescope has been created to take a lot of heavy recoils thus making it one of the toughest riflescopes in the market. Enhanced with a great range-finding reticle. Perfect fit and lightweight making it easy to carry. Safe to use with the eye relief feature. Thick reticles disadvantage shots of beyond 50 yards especially if the hunt is small. Fuzzy and blurry optics due to poor light gathering abilities. Any serious hunter understands the importance of having the right riflescope as part of his hunting gear, and the AIM Sports 4x32 Compact Rangefinder Riflescope is one of the best scopes you should consider including in your hunting kit. The scope delivers on its promises and is an assurance of a bagged deer when you proceed on a hunt. It has a fantastic reticle that will assist you to lock fast and accurately on a target. With these amazing features and low prices of the AIM 4x32 Riflescope, check it out and take some excellent shots on targets today! 5 Best Night Vision Scope: Get The Best Hunting Tool Now! How To Save Money with Review of the Barska 10×40 Blackhawk Monocular? Barnett Crossbow Scope 4x32mm: Do You Really Need It? This Review Will Help You Decide!